Sweta Vikram‘s poetry has been featured more than once on this blog, and you can check out my reviews for Kaleidoscope: An Asian Journey of Colors and Because All Is Not Lost. I’m so glad that I discovered her work because it is not only vivid, but multicultural. Her style is full of child-like imagination and sophistication as she tackles cultural themes pertaining to the human condition and the residual impact of grief. Today, I’m happy to share with you an interview I conducted with her following my latest review. Please feel free to leave your comments and questions following the interview. How would you introduce yourself to a crowded room eager to hang on your every word? Are you just a poet, what else should people know about you? Introductions vary depending on the audience. I usually never plan ahead of time. Whatever comes most naturally to me at that instant when I walk inside a crowded room and hold the microphone, I go with it. That said, there is something you should know about me: I am an obsessive-compulsive planner. My definition of spontaneity is telling my husband, “Let’s do something impromptu today.” No kidding. But, when it comes to reading my work, I let the moment take over. I have an honest, secure, and grounded relationship with words. Frankly, there is a certain vibe to every reading venue. And I rely on that energy to guide me: whether humor would work or a more serious, informal interaction in a given scenario. But the objective is to never pretend to be someone I am not. The audiences are smart; they can sniff out fakes. I have witnessed a poet take that phony-route, and it wasn’t pretty. Every performer should be respectful of those in attending. I was a radio jockey for a leading South Asian radio station in NYC. Believe me, you could never be ready for some of the questions or compliments or comments. I think it prepared me to not easily get fazed. Aside from being a poet, I am also a novelist (first fiction novel, “Perfectly Untraditional,” upcoming in April 2011), an essayist, a dancer, an oenophile, and a dedicated-walker. I do love to cook, entertain, and play the piano. My family and friends are an integral part of my life. And yoga and meditation are my mantras for keeping my sanity and creativity intact. How long have you been writing poetry and what inspired you to first write verse? I grew up in a family of poets. My father, my aunt, and few others share a special relationship with words. One could say that given my upbringing, words come naturally to me. I have been consciously writing since I was a pre-teen, if not before that. I spent my formative years in a boarding school in Mussoorie, India. I am a city person, so I didn’t take very well to the placidity of the Queen of Hills. The green mountains, the unassuming fog, the nippy air, and damp weather, though depressing, turned the place into a writer’s paradise. Every free minute that I had, I would scribble poems in my little blue diary. I often isolated myself from my peers, mentally. I could be sitting in a big group but inside my own creative-bubble. It was as if the pen and paper would call out to me, and I would relinquish the entire world. I feel the solitude of the hills not only pushed me to express my experiences on paper but also disciplined me to write everyday. Now I go away to writing residencies, in desolate locations, in search of inspiration. Look at the irony—what I wanted to run away from, as a teenager, is what I look for as a professional. Do you see spoken word, performance, or written poetry as more powerful or powerful in different ways and why? Also, do you believe that writing can be an equalizer to help humanity become more tolerant or collaborative? Why or why not? Poetry is a deeply embodied form of art and science. It can ignite passion and liberate. Poetry is about discovering yourself both as a human being and a writer. Sure, performance poetry gives a poet the power of transmission: to add life to what’s written on paper. It’s such a personal method of narrating. But if the content doesn’t resonate with the audience, however evocative the style, it’s immaterial. Similarly, written poetry carries a different onus. The power of reach is dependent on the ink, not the act. Ultimately, be it spoken word, performance, or written poetry, I feel the candor and fervor in the work shows through. Not too long ago, I was invited, along with half a dozen other poets and artists, to perform at an event’s launch. I was one of the last performers that night. And all other poets were spoken word specialists while I was going to read my written poetry. The pressure was high and unique. However, after my reading, two of the performers walked up to me and said, “Wow, that was awesome! No wonder you have a book deal.” Just like me, they had both assumed that only spoken word could have an impact on the audience. But none of us once considered that even in a crowded room, it’s ultimately the quality of words that hold the power. I have a simple rule: never underestimate or insult the intelligence and emotional quotient of a reader/listener. Oh, absolutely. I believe writing can be an equalizer to help humanity become more tolerant. I think poetry can save lives and cure the world of all its ailments. A little zealous? Perhaps, but I have faith. Poetry has a therapeutic and healing quality to it. It has the ability to take us into those dark places, which otherwise we might not want to visit or confront. Robert Frost said succinctly, “Writing a poem is discovering.” I have been in workshops where strangers have revealed personal stories about abuse, illnesses, and personal failures. When we received our writing prompts, I don’t think my fellow poets knew they were going to open up their Pandora’s Box and disclose secrets to a bunch of strangers. Poetry also makes you empathetic. I remember hugging and crying with my peers in my classes and residencies. And none of it was pretentious. Something inside of me felt moved with their stories. And I too trusted them with my personal, untold tales. Once you have shared your deepest fears with people, they become a part of you. There is a reason many of us suffer from withdrawal symptoms after spending a week at a poetry getaway and continue to stay in touch long after it’s over. (a) Help keep children out of trouble: I was amazed how much I found out about each child and his or her background through that one workshop. The thoughts lurking around the corner of minds were so uninhibitedly printed on paper. Poetry dissipates geographic boundaries and brings together cultures. It doesn’t seek the ethnicity or race or gender of a writer. The written expectations aren’t pigeon-holed. For instance, one of the literary agents (When I was sending out query letters for my fiction novel) said to me that my novel was unlike other “ethnic novels.” In that, it was a happy, immigrant story, which isn’t what the market is used to. I was baffled; in my day job in marketing, I was trained to respect a unique selling proposition. But in the case of my book, given my South Asian background, I was expected to write about the challenges of assimilation and the trauma of being an immigrant. Umm, as if that’s not been written about, innumerable times. And secondly, immigration is such a personal journey. It’s unfair to add all immigrants or their experiences under the bucket of melancholy. Times have changed and so have attitudes. The world has become global. I mean, my generation moved out of their parent country but not necessarily for money. It was to attain higher education or to experience a new culture or grow as an individual. While my husband’s aunt, who migrated from India to the United States over forty years ago, told me when they had moved there wasn’t an Indian grocery store in Detroit. She and her husband would drive to Canada to buy their basic supplies. In today’s day and age, my non-South Asian friends cook Indian recipes from scratch at home, and I cook multi-cuisines too. I believe, poetry makes you more understanding of issues and humanity. Poetry is often considered elitist or inaccessible by mainstream readers. Do poets have an obligation to dispel that myth and how do you think it could be accomplished? I don’t think there is one right or wrong answer. Each poet is different and so are his or her sensibilities. When I speak with mainstream readers, they often tell me that they don’t like feeling unintelligent and poetry can sometimes intimidate them. But it also excites them. These folks explore “accessible” poetry. Take for example American Poet Laureate Billy Collins. His work is comprehensible and widely read. In my eyes, it makes him an intelligent writer, if non-poetry devotees read his poems too. But that doesn’t mean ambiguous poets are dimwits. Not at all. It’s their style. And then are mainstream readers who enjoy complex, abstract, and open-ended works. Some poems just come to you while others have to be manifested by tapping into a certain part of the brain. I write both literal and abstract poems. I can tell you honestly, often times, the poem has its own intent. I don’t even realize which path I am going to choose. It also depends on topics and my sense of comfort with them. All writers face the problem about writing what scares them. Ultimately, it’s up to the poet to define their sense of purpose in the landscape of writing. There is space for different kinds of works. But I can’t imagine any poet would get upset if their readership increased. And people went crazy buying their books. Do you have any favorite foods or foods that you find keep you inspired? What are the ways in which you pump yourself up to keep writing and overcome writer’s block? Oh, my dentist knows when I have emerged from a pile of crazy deadlines. :-) There are tea stains visible only to her professional-eyes. I drink a lot of organic teas to get my rhythm going. The warm beverage tingles my creative-palate. I also rely on meditation, walking, and yoga to connect with my subconscious mind. With the demands of day-to-day life, it’s easy for cacophony to enter the place where unused, creative thoughts reside. I set time aside, even if for a few minutes, to connect with myself. Just shut my brains and let go. I rent writing space where, thankfully, there is no tolerance for any kind of noise. But the days I work from home, I always have soft jazz playing in the background. Or any music that connects the mind and body and spirit. I am extremely disciplined about my work and my schedule. I don’t treat it any differently from my old, day job. I believe, if I don’t respect my schedule, no one else will. And being a freelance writer takes a very different kind of commitment. It’s so easy to prioritize everything else but your work. I never wanted that to happen. This is my bread and butter and my passion. I believe the only way one can overcome writer’s block is by writing every day. There might be days that I scribble as opposed to write. But that’s better than doing nothing. Ink on paper is better than blank paper. The more you look at empty paper, the more nervous it makes you about those unproductive days. It’s a destroying, self-fulfilling prophecy. You have to train your brain like Pavlov trained the dog: see the clock at a certain time and start to write. Also, writing involves researching and reading. If words won’t come to you, go looking for them. It’s funny how many ideas come through because of one word you read in a book or magazine or a journal. But aside from hard work and long hours, I make time for my family and friends. Personal life, social commitments, and a good glass of wine are integral to my existence. Writing is here to stay, so I have to find sustainable ways of nurturing it. Do you have any obsessions that you would like to share? Off late I have been obsessed with hot chocolate with marshmallow at City Bakery in New York City. Of course I drink that and then walk for a ridiculous distance to burn those calories. But I find my muse in that blob of porous goodness. Other than that, I can’t work (or breathe?) if there is any sort of mess around me. Cluttered space clutters my brain. Did I mention that I literally worship words? What current projects are you working on and would you like to share some details with the readers? If all goes well, I have three books scheduled for release this year: One chapbook, one collaborative poetry collection (along with a visual artist), and a fiction novel. I recently finished editing my upcoming fiction novel (“Perfectly Untraditional”). Given this is my first fiction novel; this book is incredibly close to my heart. The novel, set in both India and the United States, is the story of one such immigrant who realizes the truth about her universe after she moves away. As I mentioned earlier, it’s a happy immigrant story about a modern, Indian family with all its spice galore. Women, families, youngsters, and others will be able to relate to this book. I met an Australian artist at an artist-in-residence program. She and I became friends and took to each other’s work. To cut the long story short, we both decided to work on a project together: poetry speaks to art responds to poetry. A publishing house liked our concept and made an offer. Our collaborative book (“Not all birds sing”) is scheduled for a February 2011 release. Just last week, I signed a book contract for another poetry collection tentatively titled “Clearing the fog.” I conceptualized this book while in Portugal. It’s unique in how it uses landscape to narrate the content of the book. I hope your fine readers will grab a copy of each. And if they’d like to stay updated, they can always visit my website or follow me on Twitter (@ssvik) or join my author page on Facebook. Thank you, Sweta, for taking the time out of your busy schedule to answer these questions. I wish you luck with all of your projects and look forward to reading your novel, Perfectly Untraditional. Sweta Srivastava Vikram‘s Because All Is Not Lost is a new chapbook of poems about grief and recovery. While recovering from grief is never the same for everyone, these poems speak to the void that death can leave. Vikram uses simple imagery and encapsulated stories to illustrate grief and the possible reactions to loss. In the introduction, the poets explains her inspiration for the collection, the deaths of her grandfather and her mother’s sister. The collection is sad and weighs heavily on the reader, and readers should consider taking each poem in separately to absorb their meaning. However, there are rays of hope within the poems. Because All Is Not Lost is a chapbook that will affect readers like no other poetry collection. Readers will be absorbed by the grief and the glimmers of light as the narrators deal with emptiness and blame. 1. Leave a comment about a moment of loss you’ve felt and how you dealt with it. 2. Blog, Facebook, or Tweet this giveaway and leave a link here. 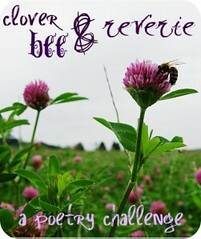 This is my 10th book for the Clover Bee & Reverie Poetry Challenge. 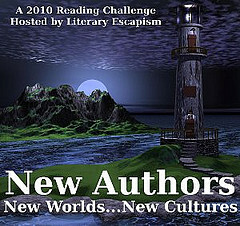 This is my 41st book for the 2010 New Authors Reading Challenge.